Almonds. Vanilla. Gluten free. Vegan. 6 grams protein per 60 g serving. Non GMO Project verified. nongmoproject.org. Certified Gluten-free. 100% whole grain. 32 g per 60 g serving. 100% of the grain is whole grain. Dairy & egg free. New look! Now with clusters. Eat well, smile often. Our mission is to provide you with the best gluten free food on the planet. Udi's is committed to making a delicious food that just happens to be gluten free, because we believe you shouldn't have to compromise on taste to live a gluten free lifestyle. Udi's granola combine certified gluten free oats with delicious ingredients you���re recognize to create mouthwatering granola clusters perfect for a morning boost or an on-the-go snack. udisglutenfree.com. Follow us on Facebook. Twitter. Instagram. (-) Information is currently not available for this nutrient. ** Percent Daily Values listed below are intended for adults and children over 4 years of age. Foods represented or purported to be for use by infants, children less than 4 years of age, pregnant women, or lactating women shall use the RDI's that are specified for the intended group provided by the FDA. 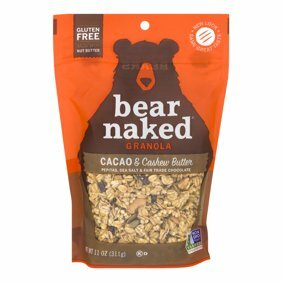 This is my favorite granola. Udi's is #1 on my list of gluten-free product makers. They've managed to maintain flavor & texture, unlike many competitors. Their products are worth the extra cost. I appreciate Udi's efforts to help people with allergies. We had to go Gluten free for health reasons and this is the beat granola that we have found. I was truly surprised that a gluten-free granola could be this good! I love it! I Love THIS FLAVOR of Udi's Granola. Not ALL are of the Quality! However, this is the 2nd time I have bought This Flavor and I Truly Enjoy It!